Daily Freeman-Journal photo by Anne Blankenship Bob Oliver stands in front of a screen with the picture of a 1969 Illinois Central train caboose that the historical committee is purchasing. The caboose will be placed on display next to the Depot Museum in the Wilson Brewer Historic Park. Another piece of history will soon find a home at the Wilson Brewer Historic Park. On Tuesday, the historical committee voted to purchase an Illinois Central train caboose for the park. 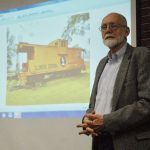 Bob Oliver, an amateur railroad historian who has been searching for a suitable train car to put on display, said the sale of the 1969 Illinois Central caboose came about quickly in the past 30 days. “Part of the exhibit at the depot has always been to be to include a piece of railroad equipment on the west side of the depot, where the original tracks would have been,” Oliver said. He added that plans call for a stretch of track to be installed for the caboose to rest on. Oliver said a caboose is a popular symbol of the railroad due in part to the fact that since 1982, cabooses are no longer required on freight trains. “Technology on the railroad has advanced just like everywhere else and the caboose became a historical artifact,” he said. The cabooses were attractive to collectors and museums, he said, and were sold by the railroads over the past 15 to 20 years. The caboose is located in Sugarland, Texas, near Houston. Oliver said the owner had refurnished the caboose to be a sort of man cave. Oliver said the train could be moved to Webster City on a freight train using its own wheels. “That’s a great advantage as it is less expensive and safer than moving it over the highway,” he said. The cost of the car is $32,500 and Oliver said four individuals, who wished to remain anonymous, came forward to donate the funds for the purchase. The committee unanimously approved the purchase of the train car and authorized $40,000, which includes transportation costs, to be transferred from the Wilson Brewer Park/Depot Foundation to the city which will write the check for the purchase. “This was just too good to let it slip away,” said Committee Chairman Gary Groves. He estimated that the caboose would arrive in Webster City sometime in the summer.